Shape, form and materials come together to create a unique outdoor wicker dining chair. 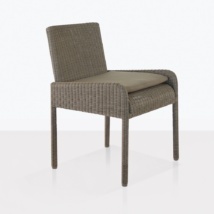 The Zambezi outdoor wicker dining chair is stylish and functional in that is stacks for easy storage. 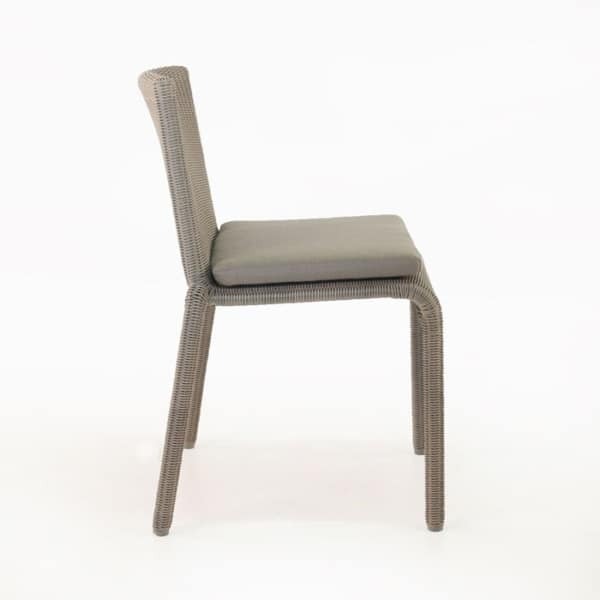 The mix of traditional wicker with the look modern shapes is what makes this chair exciting. The wicker provides an organic feel that will complement your garden dining area while keeping it up to date and in style. 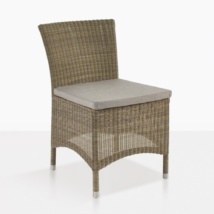 We use Ecolene® high quality wicker that will stand up to the outdoor elements. It meets all standard specifications for outdoor use. It is a polyethylene fiber that is highly resistant to different temperatures, salt water and cracking. 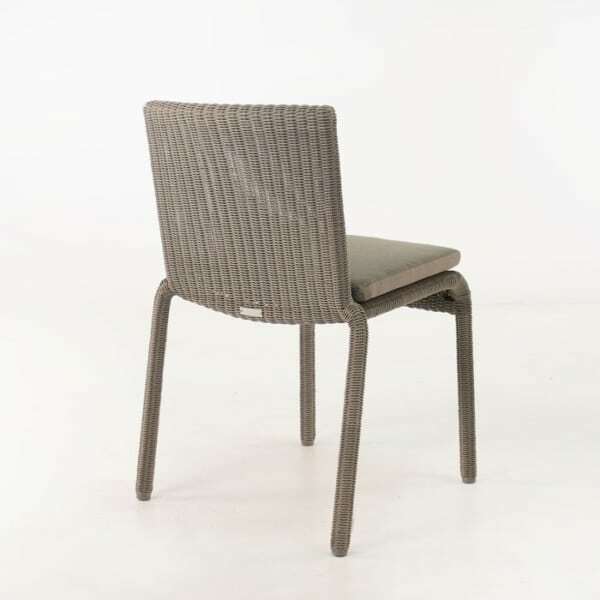 As well as being durable it has the look and feel of natural fibers. 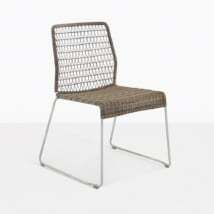 The smooth wicker is intricately woven around a powder coated aluminum frame. 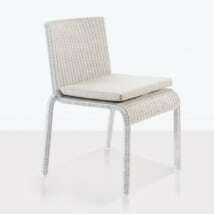 This offers strength and durability, but is also light making your furniture easy to move and arrange. 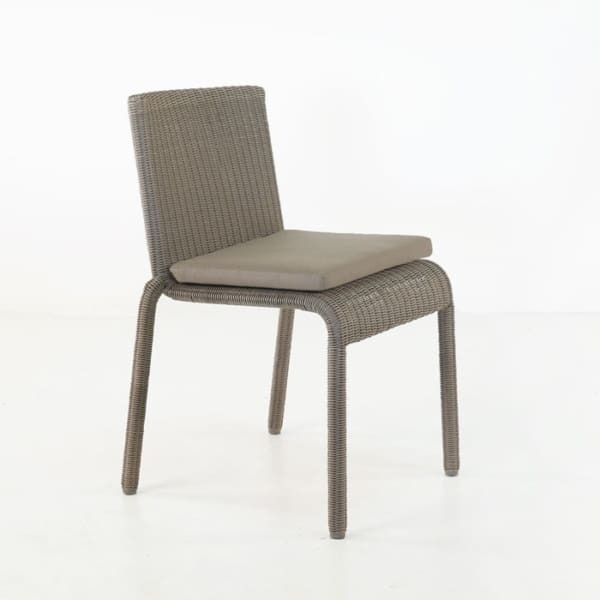 This outdoor wicker dining chair is part of the Zambezi collection which also offers a dining arm chair, sofa, lounge chair, ottoman and coffee table. 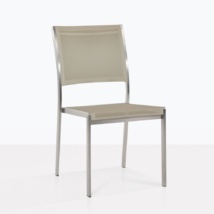 This allows you to design your outdoor space in one fantastic style. The look is easy to accessorize with plants, pillows and other décor. You can choose the pebble (light brown) wicker with taupe cushions or white wicker with canvas cushions depending on your tastes. Both colors go compliment our teak and concrete outdoor dining tables. One of the best things about Teak Warehouse is that there are so many options to mix and match different styles and materials for a look that is all your own. You can trust our quality and design to be the best. We offer so many choices for many different tastes that we are sure you will find what you are looking for to design your outdoor dining experience.